For other uses, see Seine (disambiguation). The Seine rises near Dijon in eastern central France, and flows through Paris and into the English Channel. The Seine is a river in France. It flows into the English Channel between Le Havre and Honfleur. It is 777 kilometres (483 mi) long. It is the second-longest river in France. Other important cities along its course are Paris, Troyes and Rouen. Its drainage basin has a surface of 78,650 kilometres (48,870.84 mi). The Seine starts in Source-Seine, in Côte-d'Or, Bourgogne-Franche-Comté, at an height of 444 metres (1,457 ft). Between Rouen and the sea, ocean-going vessels of up to 280 metres (920 ft) in length, and 150,000 tons in weight can travel the Seine. This section of the river has a length of about 120 kilometres (75 mi). Ships of a draft of up to 10 metres (33 ft) can circulate. Draft is a word describe the height of the part of a ship that is below the water line. There are three bridges in this section. They can be raised. The maximum air draft (or height above the water line) of a ship is 50 metres (160 ft). Because there are few briges, the river can be crossed by ferry, at different locations. The port of Rouen is an important maritime port in France; it is the most important port in Europe for cereals, and the most important port in France for flour and fertilizers. Even if the port of Le Havre is more important for petroleum, that of Rouen is still important. About 25 million tons of produce is handled by the port of Rouen each year. The course of the river was corrected between Rouen and Paris in the 19th century. There are seven locks. Barges with merchanise, of a capacity of up to 350 t can circulate. The dimension of the lock determines the maximum dimension of the ship. When most canals were built in France, the mister for public works, Charles de Freycinet determined the maximum length of the locks. As a result, the maximum dimension of the ship are 38.5 metres (126 ft) by 5.05 metres (16.6 ft), with a draft of 2.5 metres (8 ft 2 in). In the case of the French canals, the maximum draft is 1.8 metres (5 ft 11 in). The load of a peniche is about that of ten lorries or eight rail waggons. Other ship types that can circulate have a capacity of 800 tonnes (790 long tons; 880 short tons) to 1,350 tonnes (1,330 long tons; 1,490 short tons). Convois of barges with a length between 40 metres (130 ft) to 70 metres (230 ft) and can transport betweeen 3,000 tonnes (3,000 long tons; 3,300 short tons) and 10,000 tonnes (9,800 long tons; 11,000 short tons) of freight. Other ships include river-vessels that can transport up to 4,000 tonnes (3,900 long tons; 4,400 short tons) of freight. 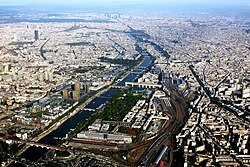 The port of Paris is the most important fluvial port in France: About 20.2 million tons of merchanise are handled each year, 20 miilon tons of this merchandise come from fluvial transport. There is a project called Seine–Nord Europe Canal, to build a high-capacity canal to connect the Paris region to the Ports of Antwerp, Dunkerque and Rotterdam, for large ships of a with of 11.5 metres (38 ft) width and 185 metres (607 ft) length. Different floods of the river have been reported. The oldest report is from Emperor Julian who reported a flood of the river in his work Misopogon in the year 358. Gregory of Tours reported a flood in February 528 in his Historia Francorum. The river has inspired different painters, mainly in the 19th and 20th century. Honoré de Balzac describes it in many of his books. Gustave Flaubert uses the river as a metaphor or image to describe the flow of time. Other authors include Jacques Prévert, and Guillaume Apollinaire. ↑ "Sandre, information on the River Seine". This page was last changed on 20 February 2019, at 10:20.